The Bayou Renaissance Man had a great post on swarm drone offense. 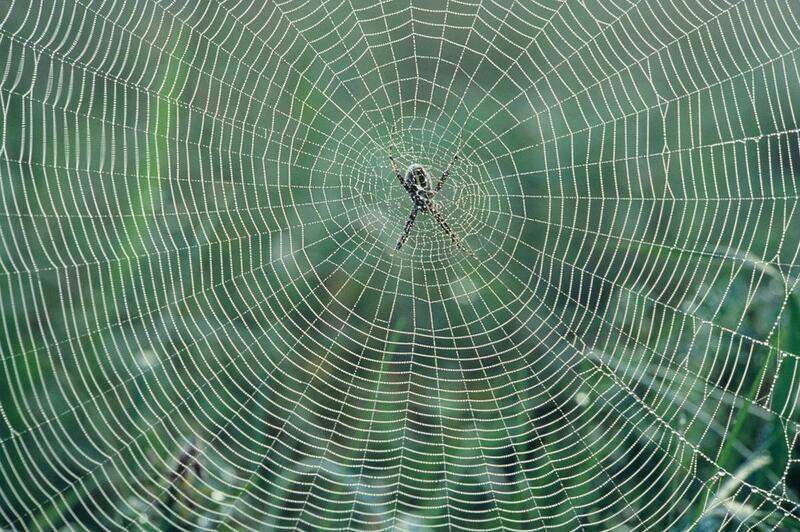 It reminded me of a concept for ICBM defense where the impact projectile was...a silk spider web. While it seemed ludicrous on the face of it, the math proved otherwise. An IBCM has a velocity of approximately 6km/second (32k mph or 40,000 fps). The intercept missile must have very close to the same velocity to match orbital arcs and maximize chances of a hit. Since energy is 1/2 .Times. mass .Times. relative velocity^2, you can see that a single strand of a silk spider web hitting the nose cone of an IBCM would ruin its day. While the strand would vaporize and become incandescent, the momentum transfer would ensure the entire module caving in and going tango-uniform. One wonders if the best kinetic weapon projectile to launch at drones might be spider webs of stretchy threads like nylon. #69 nylon thread has a breaking strength of 11 pounds and is very good at managing energy because it is stretchy. 40 grains of #69 thread is 100 feet long. The bullet of the lowly .22LR weighs 40 grains. Most 5.56X45mm rounds are 55 grains. That thread would be 140 feet long. The 9mm of Glock and sub-gun fame typically shoots a 115 grain bullet. That thread would be 300 feet long. Life really starts getting interesting when looking at shotshells. Shotshells are typically loaded with wads that take up a great deal of space. This is due to the blackpowder legacy of shotshells. Smokeless propellants are much more compact and left a great deal of excess room in the package. Thread is less dense than lead. Shotshells have the potential to hold the extra volume of the nylon payload that comes close to matching the mass of the more traditional, lead, payloads. A standard 1 1/8 oz 12 gauge shell typically holds 495 grains of payload. That equates to 1200 feet of #69 thread, almost a 1/3 of a mile. Of course there are technical challenges in delivering the payload to the correct altitude and then deploying. Rifled choke tubes would be the low-tech way to address that. Spinning the spiderweb would cause it to unfurl. The more slowly it unfurls the higher it goes and the longer it takes to drift down. Having enough mass at the ends that the rotation would unfurl the web. For those you'd need something massy...like lead or tungsten. And those would cut into the payload.